Oh my, did someone mention Captain Spectre? I hope so....Sorry everyone it takes so long between these updates, but if you visit here often you might know I have been a bit busy. I do apologize to you all. I want to finish this up and move on to the comics and such. Just time isn't the one thing I have too much of. Anyway here is poor Sam trying to figure it all out. I promised some people I would show up for sketches on free comics day. So I did some prelim sketches to give out for free. Here is a Red Sonya I sketched out. 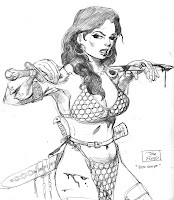 I figured I would auction off a free sketch about every twenty minutes or so. So if you are in the Lincoln area and know where Trade-a-Tape is come on by. I have never made into town for a free comic day so this will be a new experience for me. I just felt that since I wasn't going to any cons this year I would help out around the local comic shop. Also other members of the Nebraska Comic Creators Assoc. will be there doing sketches and the like. Throw your name in the hat and hang around to win a free sketch. And get some free comics. Well it has been some very late nights around the secret headquarters of the Lightning Legion. Well it is always a late night, since I don't sleep much....but I am usually reading or watching old movies very late at night....but lately I have been working very late. I have finished the first issue of the Phantom mini series lettering job, the day job stuff is finally starting to flow and get done, and tonight I snuck in some inking on the attack of the beast-men vs. Helene piece. Of course this is going to be cropped down so thought you would like to see the whole thing. I also had a scanner malfunction....my computer just wouldn't see it anymore. I finally did something and it started working. Wish I knew what I did for the next time it quits on me. Since I probably won't have anything new I will be able to show this weekend. I thought I would show a couple of blasts from the past. Back when I still painted on canvas and even in ink wash. 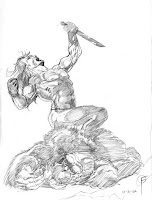 The Lovers painting was for a study I did, the Joan of Arc was for Steve Jackson games I think, and the Tarzan piece was a study for the cover painting of the edition of Tarzan of the Apes I illustrated. These are from my totally outdated portfolio website. I have a lettering job to knock out this weekend, plus this will be the first weekend of mowing season. I am sure the mowing will take the better part of a day to get done. After all I mow over 5 acres at a time. It usually takes about five hours to get it all done right. Less if I don't pay much attention. But I will try to at least let everyone know how it all went, and at least post some more older work that some of you might not have seen. Some days you just want to hit something. Well, most days lately it seems. But this evening was fairly productive. 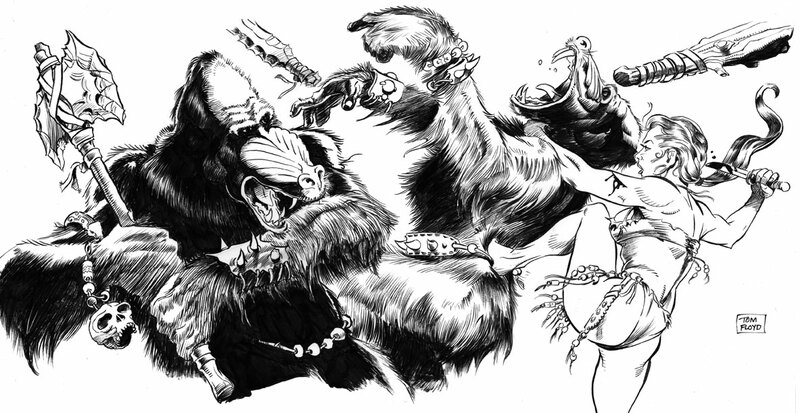 I am working on the next illustration for the KiGor pulp story. After all you can't beat stone age weapon wielding mandrills for fun! I am having some trouble fitting all the action into this format that I like. I also have to consider the center fold of the book. I personally don't like the art going into the fold and never coming back out. So I am trying to keep the action on sides with the least important items in the center, or the fold. I have seen books where people don't pay much attention to that and it really drives me nuts. Especially when it is an art book, or a comic with those big double page spreads. I am also hot at work writing the first full Captain Spectre issue. I had some good ideas floating around today while I was working at the day job stuff. Thank goodness they can't control my mind while I work, I am sure they have tried. I think it will be a fun story. Here is the final version of 'up a tree' from the Ki-Gor story 'War of the Beast-Men' written by Martin Powell. Hope everyone likes it. Sorry but just don't have much else to say about it. Things have turned to hell at my day job and I may be looking for a new one sometime in the near future. Or maybe I will try to make a go of it doing comics for money. I just don't know. It was a bad day today is all I know. I won't quit, they will have to get rid of me so the government will give me all that unemployment money. Thanks to all you taxpayers out there. Anyway enjoy the art, I had a blast doing this one. Now on to the next one. As promised a bit more progress. This time the 'up a tree' scene, as Kigor trys to save his pygmy friend from the Irwin Allen lizard. It still needs alot of work, but honestly it has been a long weekend. I started at six this morning on this and it is now about 9:5o here. So the eyes are starting to blur and not focus. But as promised more progress. I also have to add more rain effects. and push and pull some of the shapes into foreground and back ground. But it will be finished soon. then on to the next piece. Enjoy....Legionnaires. Well not sleeping much has some advantages. Maybe not in the long run, but if I give up a few nights now and then, I get some work done. Ok, here is a question for you. 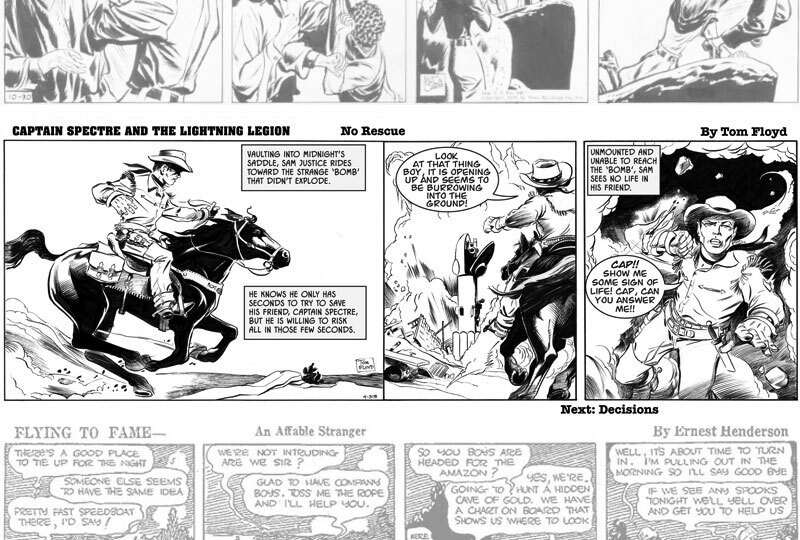 Since I am a huge fan of pulps, and this widevision format from Moonstone is kind of like a modern pulp....should I grayscale the images? or leave the line work alone? 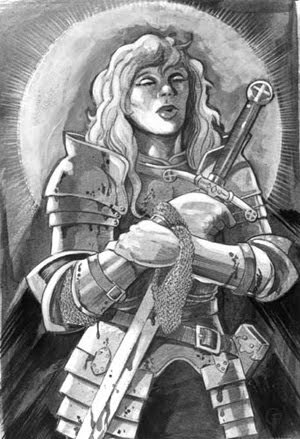 For the most part I think the folks at Moonstone would prefer the grayscaled image thinking since the book isn't color, at least I don't think it is....I better check on that, grayscale is the next step down. Let me know what you think. More progress later this weekend, Legionniares. Progress, slow and steady progress, I hope wins the race. Well it isn't exactly a race until I go past the deadline. Whenever that is. But, I thought you Loyal Legionnaires...and I guess members of the KiGor Jungle Patrol, ha, would like to keep up on the progress of this KiGor pulp widevision story for Moonstone. Here we have Helene 'stripping' down for jungle action. And of course the scientists on the safari she is leading are shocked and amazed at the freedom she prefers in the jungle. At this stage I have the pencils in place and have started hacking away with my brush. Of course the scientists are all the stereotypical types. First of all let me thank all you voters again for taking part in the poll. Please don't feel left out if your choice didn't win. I plan to do all three of those stories, as I mentioned in the last post, and plan to do my best on all of them. So if you think you lost your choice....think of it this way by the time I get to the third one I will be a better writer, and a better artist....ha. I hope. Also as you can see I have finished inking one of the Ki-gor pieces for Martin Powell's pulp story that will appear in a Moonstone book of pulp heroes. So as I start on these pieces, I am starting to write the first Captain Spectre comic, also trying to squeeze in some time here and there to finish off Chapter 4, and also the Ki-gor comic story is looming in the near distance also. I also have to start writing my speech to give to the Burroughs society when I get to Chicago later this summer. Jeff Long of the Burroughs Panthan group has a website covering the event so take a look here. It is going to be a good time. So if you are a Burroughs fan and in the area you should think about going. If for no other reason than to throw things at me as I try to speak in front of lots of people. I sure don't want to use the old trick of imagining them naked, since us Burroughs fans are getting a bit long in the tooth.....yikes. And once again, if I don't thank you enough for looking in on the strip, and this sketchblog... consider yourself thanked once again.......I do appreciate it, and all the feedback. The results are in from the what kind of story you would want Captain Spectre to star in, and that you would want to read. I want to thank everyone who visit the site and voted. It means alot to me as a creator to try and bring the kind of stories to you people who want to read stories in the genre that Captain Spectre and his crew inhabit. The winner is a good old fashioned good vs. evil action yarn with 52 percent of the votes. So since I try to listen to you Loyal Legionnaires, that is what the very first print issue of Captain Spectre will be. But fear not all you other Loyal Legionnaires who voted. I will produce, in time, the other two stories that you voted on. 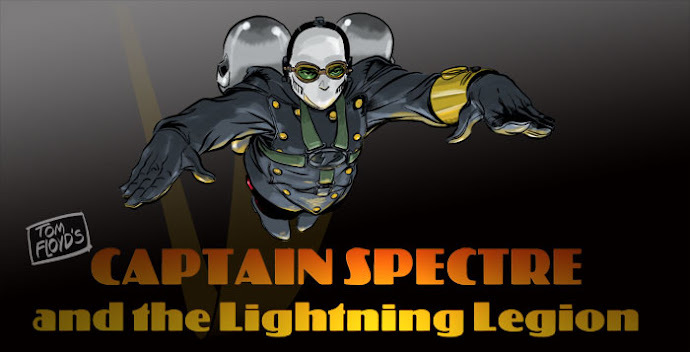 So not to give anything away, Issue 2 of Captain Spectre will be a thrill-packed World War 2 adventure. Then Issue 3 will be a strange sword and planet adventure, in the vein of Almuric, or John Carter of Mars. I must say those are great results for the first three issues of the printed adventures of Captain Spectre. Now as they say all I have to do is write them, draw, ink, color, letter, and print them. So as the on line strip ends Chapter 4, I will pour my heart and soul into the first issue. Again thanks to all the Loyal Legionnaires out there who spoke with their vote. It's all for you.